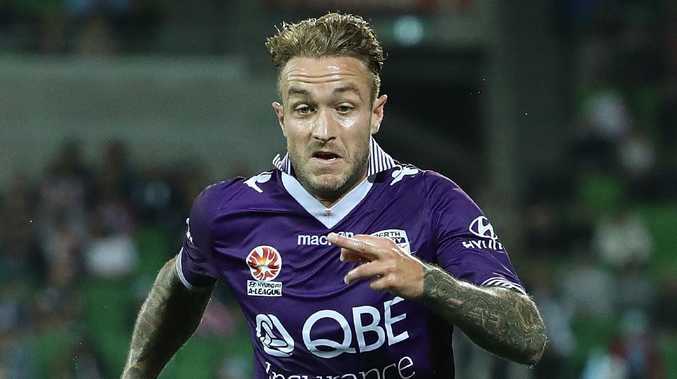 Adam Taggart has made the move from Perth Glory to Brisbane Roar. ADAM Taggart says playing under John Aloisi at Brisbane Roar gives him his best chance of regaining his Socceroos jersey. Taggart, 25, was a member of Australia's 2014 World Cup squad but has not donned the green and gold for the past four years. Determined to revive his international career, Taggart jumped at the chance to move to the Roar from Perth Glory in the off-season, believing that under the tutelage of ex-Socceroos attacker Aloisi, he can add to his seven appearances for Australia. "I wanted to work under John Aloisi, him being a former striker and had a great record with developing young players," Taggart said. "Perth was my hometown club and it was nice to play there but I was keen to have another crack at trying to break into the national team. "My main goal throughout my career is to see how far I can go and I think this move is something that's going to help me develop and progress into the player I want to be." Australia's failure to score in front of goal at the 2018 World Cup and this week's retirement of the Socceroos' all-time leading goalscorer Tim Cahill, has the Socceroos crying out for someone to find the back of the net regularly under new coach Graham Arnold. 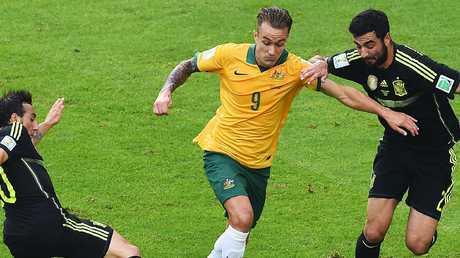 Adam Taggart in action for the Socceroos against Spain at the 2014 World Cup. "Tim's departure is massive. He's an extremely unique player and someone that will be remembered forever," Taggart said. "Everyone's on their own journey and mine has led me here. I'm going to make the most of what I can here and that's the only thing I can focus on, and if the rewards come then great, and if not then I've still come here for the same reason, to be the best players I can be and be a part of a club with a great history. "It's great for the Socceroos to have another good Australian coach who obviously knows all the Australian players. I'm sure it will be a massive step in the right direction." The Roar yesterday announced that airconditioning manufacturer ActronAir would be the club's major sponsor for the next two years. "As a proudly Australian company that prides ourselves on high quality and consistent performance, the opportunity for ActronAir to partner with one of Queensland's success stories was too good to pass up," ActronAir executive chairman Robert Mundy said.